WEST LAFAYETTE, Ind.  Researchers from Purdue University are working to develop a high-altitude, helium-filled craft that may hover over the same spot for up to a year for applications in areas such as surveillance, homeland security, missile defense and weather forecasting. About 10 Purdue researchers are involved in the work, funded by the U.S. Air Force Research Laboratory. "The concept is to have an airship that flies above 65,000 feet and is geostationary, which means it stays in the same position over the Earth," said Oleg Wasynczuk, a professor of electrical and computer engineering at Purdue who is leading the project with John Sullivan, a professor of aeronautics and astronautics. Engineers and scientists are working to develop solar cells and an advanced fuel cell to power the craft. They also are developing the aerodynamic design and a control system to help keep the airship steady amid high winds and computer simulations to show how the craft would perform given specific design characteristics. "To stay geostationary, it must have motors onboard to provide thrust so that it can constantly be reoriented because the wind is blowing up there," said Sullivan, who is in charge of the portion of the research focusing on developing the ship's aerodynamic design. Purdue researchers also are developing mathematical models to simulate the fuel cell's performance. "No such fuel cell system has yet been developed for space applications," said Shripad Revankar, an associate professor of nuclear engineering who is heading the fuel cell portion of the work. "Thats why we are using models to simulate how it will perform. "The fuel cell is going to be a very large system. It will generate 500 kilowatts, which is about 10 times as much electricity required for the average home." The airship is intended to fly well above commercial aircraft, which cruise as high as 40,000 feet, and conventional blimps, which reach around 5,000 feet. It would have better surveillance capabilities than satellites because it would be closer to the ground. Another advantage is that the ship could hover over one location anywhere in the world, whereas satellites are geostationary only over the equator, Sullivan said. Because the unmanned ship might have to remain in flight for as long as a year at a time, it would have to be equipped with innovative power systems to provide electricity. A portion of its skin would be covered with photovoltaic cells, which convert sunlight into electricity. The photovoltaic cells would provide electricity during the day to power the ship and also run equipment that turns water into hydrogen and oxygen. During the night, the hydrogen and oxygen would then be used to run the "regenerative fuel cell," said Revankar. As the fuel cell generated electricity, it would produce water, which would be returned to the system to begin the cycle over again during daytime hours. Researchers must simulate how the fuel cell would interact with the ship's various systems, including those for communications, surveillance and the electric motors for thrust. "We create mathematical models so that we can predict the fuel cell's behavior while it is interacting with a grid that contains all of these different systems," Revankar said. "Say the wind suddenly picks up and the motors have to be turned on to keep the airship from drifting. How will this impact power to other systems on the ship? We need to know how the fuel cell will perform given the dynamic nature of this grid. "Eventually, engineers will be able to use this model to design a fuel cell for other applications." The ship would have to be equipped with power systems capable of running continually without refueling. "Thats why it's got to have solar cells, which generate in daylight enough power to run the electric motors for thrust and enough power to charge either batteries or fuel cells," Sullivan said. Engineers are not yet certain how large the airship might be, but it may be as long as 300 meters, or around 900 feet  roughly four times the length of the Goodyear blimp. 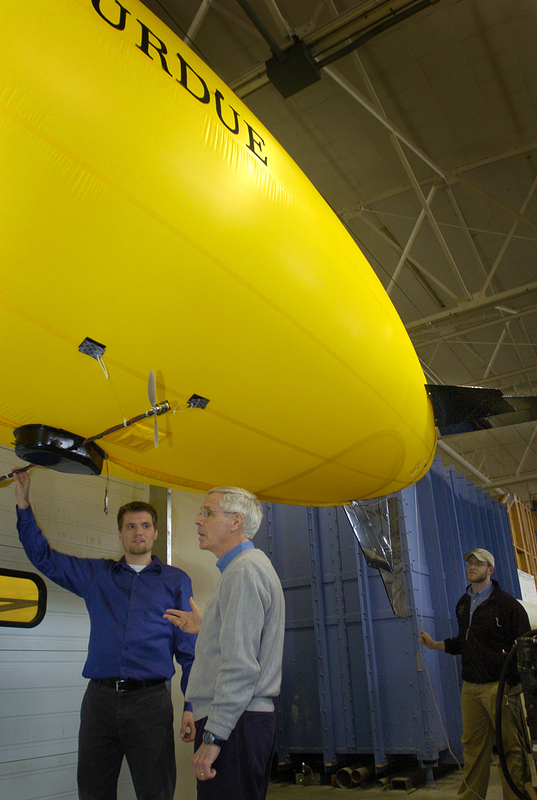 "We are building a mathematical model to determine the airship's size and other design characteristics," Sullivan said. "Our model predicts how the airship will perform, how much power it will need at a given time, depending on how large it is, while carrying a certain payload, at a certain altitude, with certain wind gusts and so on." A major challenge will be finding materials for the airship's skin that are capable of withstanding the extreme ultraviolet radiation at such high altitudes for extended periods, Sullivan said. Another important factor is determining how the airship would react to changing temperatures as the sun rises and sets every day, heating and cooling the helium. The cyclic temperature changes will cause the ship to rise and fall in altitude. The Purdue researchers also are working with PC Krause and Associates Inc., a company specializing in controls and simulations, located in the Purdue Research Park.